In recent months, the GOP has exposed the true extremism of its immigration policies. Any mention of “compassion” or a pathway to citizenship is essentially gone, replaced with hardline policies that range between draconian and overtly fascist. This transition has been largely driven by the ascension of Donald Trump as the party frontrunner despite his anti-immigrant comments (ex. Mexicans are rapists and we should build a wall then force Mexico to pay for it). Hoping to emulate Trump’s success and steal some of his nativist supporters, other GOP presidential frontrunners have copied and built upon his hardline ideals. They fear being seen as too liberal on this issue, yet fail to recognize that they are so far right that any sane policy solution would be, by definition, “too liberal” from their perspective. 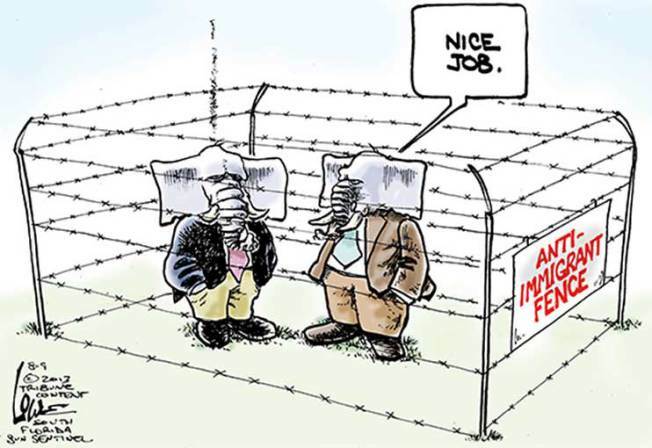 On the “moderate” end of the GOP’s immigration policies, there are advocates (ex. Bush) for creating a second-class legal status for the undocumented while they work through a years-long process to get to the back of the legal immigration line. These policies would let businesses employ the undocumented as “guest workers” who are shielded them from deportation, but are forced to pay taxes with no hope of receiving any benefits. Undocumented immigrants could live in this second-class status for over a decade before they could have any hope of being legalized and would have no political power or ability to claim public welfare benefits. 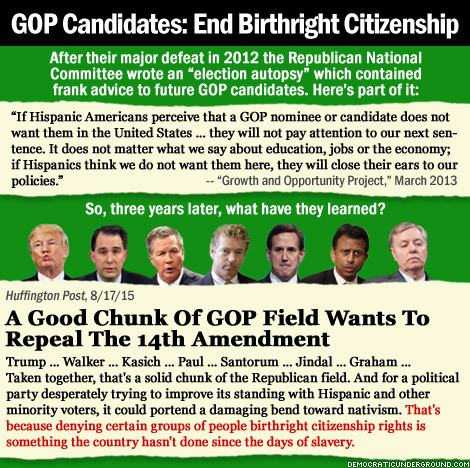 The “mainstream” immigration policy within the GOP advocates for eliminating birthright citizenship, deporting entire families (including children born in the USA), and investing massive amounts of money to shut the southern border (either through a wall of a massive increase in border patrols). Additionally, these plans would punish “sanctuary cities” with financial sanctions, and would cut public services aimed at helping undocumented immigrants (ex. giving in-state tuition at state schools for undocumented residents). This is a draconian policy that leaves no possibility of a path to citizenship—in order to even be considered for legal status, immigrants would need to leave the nation, pay back taxes, and wait a penalty period before entering the back of the line. Other than Bush, virtually every GOP candidate for president supports some version of this plan, if not a more extreme policy. On the extreme—if not fascist—end of the GOP’s immigration policy spectrum, there are advocates for enslaving undocumented immigrants if they refuse to leave the nation. This extreme end of the spectrum was revealed when Jan Mickelson, an influential Iowa conservative, proposed a plan where any undocumented immigrant to be in Iowa after 60 days would become state property and would be forced to work as a slave (presumably, as Mickelson would also eliminate birthright citizenship, any child of an immigrant in slavery would also be a slave). 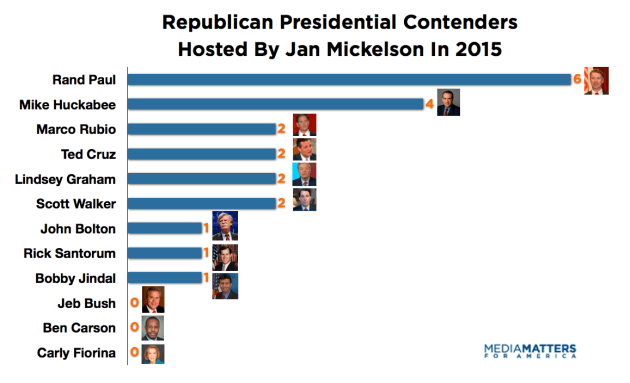 After making his position known, Mickelson was not isolated or ostracized—in fact, he has hosted several GOP front-runners on his show since his support of slavery was exposed. The GOP’s support for enslaving undocumented immigrants is not limited to one crazy conservative in Iowa and a bunch of crazy racists in the base. Donald Trump, the current front-runner in the GOP race, is openly supporting a plan where incarcerated immigrants would be forced to help build a border wall before being ejected from the nation. Similarly, longtime Fox News pundit Jessie Watters proposed a plan where undocumented immigrants would be incarcerated, forced to build the southern border wall, and then given “earned amnesty” which allows them to stay in the nation. Put simply, the policy proposals being presented by the GOP on the issue of immigration range between extremism and lunacy. They reject the historical reality that our nation was built by immigrants and ignore the numerous studies which conclude that illegal immigration has no significant negative consequence on the American people. Their policies cater to the GOP’s xenophobic base and are grounded in paranoid talk radio fearmongering rather than objective reality. The shift of the Overton window (the scale of “acceptable” policy proposals on an issue) on the issue of immigration is very worrying to anybody who supports treating immigrants with basic human decency. That said, there is a silver lining to the vast dark cloud that is the GOP’s immigration policy platform: Because they have gotten so extreme and overt in their hatred, the GOP has essentially lost the votes of the Hispanic/Latino population in our nation. From a purely demographic perspective, this loss of the Hispanic vote hurts the GOP during national elections and creates a virtually impassible roadblock for them to overcome during presidential elections. While the GOP has a long history of winning elections with a base of highly motivated white voters, this is not sustainable anymore. The Hispanic population is growing far faster than the white population and population growth models estimate that whites will be a minority within the next 30 years. If the GOP doesn’t move to the center, it will rapidly become irrelevant in most national elections and will be condemned to surviving only in racially segregated districts and through suppressing the non-white vote. Read the 13th amendment, and the 14th as well while you’re at it. We have immigration laws, and if they were enforced properly we would not have a problem to begin with. 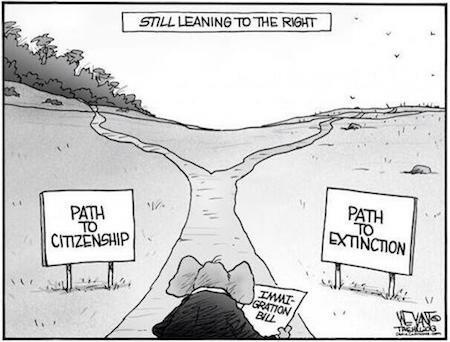 Path to extinction? Yes, that is quite cynical, or would fearmongering be more appropriate? Maybe “Path to sustainability” would be a better term. The GOP is being pushed further and further to the right, their base shows their fear and their leadership responds with red meat. It would be funny were it not for the passivity of the Left when it comes to voting.